[S542] Index - New Zealand BDMs online, at http://www.bdmhistoricalrecords.dia.govt.nz/, Birth Reg. No. 1882/8873. [S703] Newspaper - Southland Times, issue of 28 Apr 1882, issue 4307, p2, col3, Birth. [S443] CD - NZ Marriages, CD - NZ Marriages 1836-1956 V2, NZ Registrar General's Folio 1528. [S542] Index - New Zealand BDMs online, at http://www.bdmhistoricalrecords.dia.govt.nz/, Marriage Reg. No. 1913/2038. [S801] Newspaper - Auckland Star, issue of 29 Mar 1913, Vol XLIV, issue #75, p12, col1, Marriages. [S542] Index - New Zealand BDMs online, at http://www.bdmhistoricalrecords.dia.govt.nz/, Death Reg. No. 1958/34864, aged 75. [S568] Purewa Cemetery & Crematorium database, at http://www.purewa.co.nz/, serial #515, cremation and burial of ashes. [S568] Purewa Cemetery & Crematorium database, at http://www.purewa.co.nz/, serial #20109, burial of ashes, block B, row 3, plot 10 (with his father). [S542] Index - New Zealand BDMs online, at http://www.bdmhistoricalrecords.dia.govt.nz/, Birth Reg. No. 1914/9769. [S863] Newspaper - New Zealand Herald, issue of 31 Dec 1913, Vol L, issue 15494, p1, col1, Births. [S443] CD - NZ Marriages, CD - NZ Marriages 1836-1956 V2, NZ Registrar General's Folio 2501. [S542] Index - New Zealand BDMs online, at http://www.bdmhistoricalrecords.dia.govt.nz/, Death Reg. No. 1967/23958, aged 53. [S542] Index - New Zealand BDMs online, at http://www.bdmhistoricalrecords.dia.govt.nz/, Birth Reg. No. 1893/2075, and Death Reg. No. 1981/40617 gives this birthdate. [S443] CD - NZ Marriages, CD - NZ Marriages 1836-1956 V2, NZ Registrar General's Folio 4121. [S542] Index - New Zealand BDMs online, at http://www.bdmhistoricalrecords.dia.govt.nz/, Marriage Reg. No. 1920/473. [S542] Index - New Zealand BDMs online, at http://www.bdmhistoricalrecords.dia.govt.nz/, Death Reg. No. 1950/31112, aged 60. [S542] Index - New Zealand BDMs online, at http://www.bdmhistoricalrecords.dia.govt.nz/, Death Reg. No. 1981/40617. [S542] Index - New Zealand BDMs online, at http://www.bdmhistoricalrecords.dia.govt.nz/, Death Reg. No. 2008/23221 gives this birthdate. [S443] CD - NZ Marriages, CD - NZ Marriages 1836-1956 V2, NZ Registrar General's Folio 5644. [S542] Index - New Zealand BDMs online, at http://www.bdmhistoricalrecords.dia.govt.nz/, Death Reg. No. 1970/28954, aged 50. [S542] Index - New Zealand BDMs online, at http://www.bdmhistoricalrecords.dia.govt.nz/, Death Reg. No. 2008/23221. [S1131] MemoryTree NZ, at http://www.amemorytree.co.nz/index.php, aged 92, Sadliers Funeral Services. Eliza HANHAM was born in Bridport, Dorset, circa August 1812. 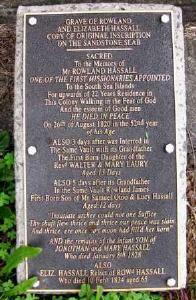 She was widowed on the death of her husband Richard before September 1849. [S542] Index - New Zealand BDMs online, at http://www.bdmhistoricalrecords.dia.govt.nz/, Death Reg. No. 1891/6281, aged 76. [S488] Index - Queensland BDMs (online and fiche), at https://www.qld.gov.au/law/…, Marriage Reg. No. 1938/B32885. [S489] Brisbane City Council Cemeteries database, at https://graves.brisbane.qld.gov.au/, Portion 14A, grave 755. [S488] Index - Queensland BDMs (online and fiche), at https://www.qld.gov.au/law/…, Death Reg. No. 1943/B60789. 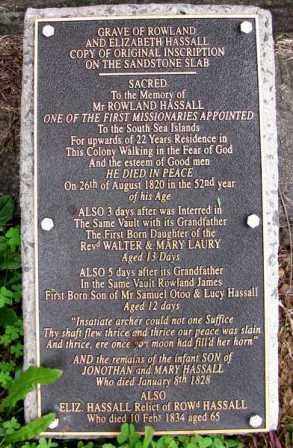 Paul Edward HANLEY was born in Queensland. [S542] Index - New Zealand BDMs online, at http://www.bdmhistoricalrecords.dia.govt.nz/, Birth Reg. No. 1888/1375, father's name mis-recorded as Lois. [S1041] Book - Jo Ann Hansen Rasch, Blowing Feathers, p149, recollections of his brother David. [S542] Index - New Zealand BDMs online, at http://www.bdmhistoricalrecords.dia.govt.nz/, Death Reg. No. 1942/23638, aged 54. [S1041] Book - Jo Ann Hansen Rasch, Blowing Feathers, p149. [S542] Index - New Zealand BDMs online, at http://www.bdmhistoricalrecords.dia.govt.nz/, Birth Reg. No. 1890/13293 and Death Reg. No. 1982/45473 gives this birthdate. [S542] Index - New Zealand BDMs online, at http://www.bdmhistoricalrecords.dia.govt.nz/, Death Reg. No. 1982/45473.